NEWPORT, Ky. — Thursday marks a historic anniversary for the preservation of one of the most recognizable animals in the United States – the American alligator. Twenty-eight years ago on June 4, 1987, the U.S. Fish and Wildlife Service removed the American alligator from the Endangered Species List, just 20 years after the implementation of the Endangered Species Preservation Act. After enjoying a bountiful population for millions of years, the American alligator became on the verge of extinction in the 20th century, mostly due to over-hunting for the production of consumer goods. Thankfully, with the help of the Endangered Species Preservation Act (1966) and the Endangered Species Act of 1973, the over-hunting of American alligators came to a halt. Today, the American alligator population is thriving throughout the Southeastern U.S. – so much so that they sometimes give people a cheap thrill by showing up unannounced in their back yards. Mighty Mike is more than 14 feet long and 800 pounds. Such was the case for Mighty Mike – the biggest and baddest alligator outside the state of Florida who resides at Newport Aquarium. Back in 2000, the more than 14-foot, 800-pound gator was found basking on a boat dock in Lake Talquin, Fla. Because of his large size, Mighty Mike was considered a threat to locals. State wildlife authorities declared him a nuisance and ordered him destroyed, as required by Florida law. Fortunately, the trapper who caught Mighty Mike knew he was special because of his size and asked a local reptile expert to provide Mighty Mike with a new home. Since that time, Mighty Mike has served as a traveling ambassador for American alligators and has captivated millions of viewers who marvel at his enormous size. Despite the American alligator’s overall population thriving, the species has a subpopulation that is in danger of becoming extinct – white (either albino or leucistic) American alligators. Because they have a difficult time blending into their surroundings, making them either easy-to-spot prey or easy-to-avoid ambush predators, there are less than 100 known white alligators in the world. 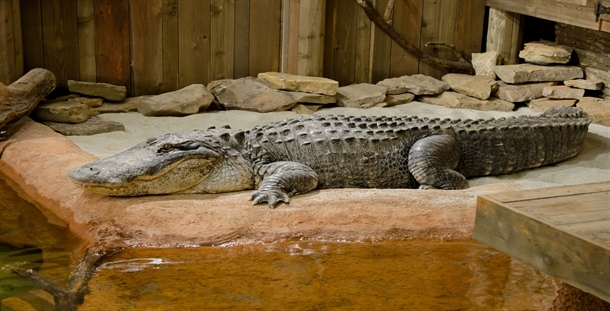 Newport Aquarium is the home to two albino American alligators, Snowball (male) and Snowflake (female). Since their gene pools are separated far enough, it is the hope of Newport Aquarium officials that Snowball and Snowflake will eventually mate to help with this subpopulation’s growth. Guests can see Mighty Mike, Snowball and Snowflake at Newport Aquarium’s Gator Alley exhibit, which showcases six species of crocodilians from four continents – one of the most diverse collections of crocodilian species in the country. This entry was posted in Alligator and tagged albino alligators, American Alligator, Endangered Species Act, Mighty Mike, newport aquarium, Snowball, Snowflake, White Gators by NewportAquarium. Bookmark the permalink.